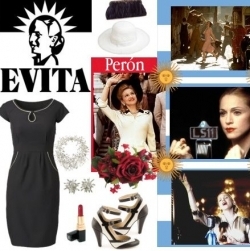 Extraordinary musical Evita with the signature of Tim Rice and Andrew Lloyd Webber at the Badminton Theatre in Athens, Greece. -Don't Cry For Me Argentina - On This Night of a Thousand Stars - Another Suitcase in Another Hall - Oh, What A Circus - You Must Love Me and many more. West End star Rachael Wooding plays the role of the extraordinary Eva Peron, wife of former Argentine dictator Juan Peron. From young and ambitious beginnings, Eva gained enormous wealth and power during her ultimate rise to sainthood. Wooding's West End musical theatre credits include Hairspray, We Will Rock You, Saturday Night Fever as well her UK and national tour credits of Footloose, Starlight Express and Cats. Joining Wooding in the role of Che is Seamus Cullen, popular finalist from BBC TV's Any Dream Will Do and Mark Heenehan as Juan Peron, whose film credits include The Road to Damascus, Spy Game and Thunderpants.